In May of 1872, having recently travelled twice to watch Aida, a disappointed Italian gentleman named Prospero Bertani decided to write a letter of complaint to the opera's composer, Verdi, and ask for his money back; not just for the show, but for his expenses too. Amused, Verdi responded by forwarding the letter to his publisher, Giulio Ricordi, with instructions. The chain of correspondence can be seen below, along with a written promise from Bertani never to watch the opera again. To Bertrani's dismay, Verdi later arranged for his letter of complaint to be published in a number of Italian newspapers. 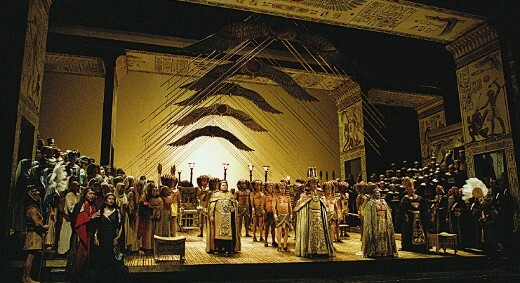 On the second of this month, attracted by the sensation your opera Aida was making, I went to Parma. Half an hour before the performance began I was already in my seat, No. 120. I admired the scenery, listened with great pleasure to the excellent singers, and took great pains to let nothing escape me. After the performance was over, I asked myself whether I was satisfied. The answer was in the negative. I returned to Reggio and, on the way back in the railroad carriage, I listened to the verdicts of my fellow travellers. Nearly all of them agreed that Aida was a work of the highest rank. Thereupon I conceived a desire to hear it again, and so on the forth I returned to Parma. I made the most desperate efforts to obtain a reserved seat, and there was such a crowd that I had to spend 5 lire to see the performance in comfort. My address: Bertani, Prospero; Via St. Domenico, No. 5. As soon as I received you last letter I wrote to our correspondent in Reggio, who found the famous Signor Bertani, paid the money, and got the proper receipt! I amc opying the letter and receipt for the newspaper, and I shall return everything to you tomorrow. Oh, what fools there are in this world! But this is the best one yet! The correspondent in Reggio writes me: "I sent immediately for Bertani, who came to me right away. Advised of the reason for my invitation, he first showed surprise, but then said: 'If Maestro Verdi reimburses me, this means that he has found what I wrote fim to be correct. It's my duty to thank him, however, and I ask you to do it for me.'" Pleased to have discovered this rarity of the species, I send the most cordial greetings to you and Signora Peppina. I, the undersigned, certify herewith that I have received the sum of 27.80 lire from Maestro Giuseppe Verdi, as reimbursement of my expenses for a trip to Parma to hear the opera Aida. The Maestro felt it was fair that this sum should be restored to me, since I did not find his opera to my taste. At the same time it is agreed that I shall undertake no trip to hear any of the Maestro's new operas in the future, unless he takes all the expenses upon himself, whatever my opinion of his work may be. In confirmation whereof I have affixed my signature.